An opulent pair of Hime daruma prince and princess dolls from Ehime Prefecture in Shikoku has graced the living room of Tamiko Okamoto’s home in Funabashi, Chiba Prefecture, since 1964. A wedding gift from a close friend, the dolls, side by side in a glass case, had been part of the family for all those years. But when her husband died six years ago, Okamoto thought it was also time to bid farewell to those witnesses to their life together. As well, 40 years had tattered their kimonos, and the colors were fading. Earlier this year, Okamoto was excited to learn about the Kiyomizu Kannondo Temple in Tokyo’s northern Taito Ward. 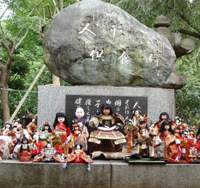 At that temple in Ueno Park, she found out that a ceremony called ningyo kuyo is held annually to pray for dolls and thank them for giving their owners many fond memories. It is also a way for owners to release dolls from their hands and lives. On Sept. 25, Okamoto was one of many dozens who took their dolls to the temple to be prayed for and then discarded. They included traditional ones such as Hina ningyo doll sets representing emperor and empress, attendants, court musicians and guards, which are traditionally given on the March 3 annual Hinamatsuri (Doll Festival), when families with daughters display them as a way of expressing hope for their future happiness. As well, that day at the temple, numerous soft-toy animals or animation characters were among the many “offerings” made. At 2 p.m., five monks started reciting sutras in front of a monument on which several dolls were displayed. The monks then moved over to a small hearth, where some token representatives of the dolls were burned to ashes. Okamoto and the other assembled owners all put their hands together in prayer as if they were attending a funeral. A week before Okamoto bid goodbye to her beloved dolls, Noriko Yamada, 60, shared a similar experience in Tokyo’s Setagaya Ward, where she lives. At the local funeral hall, called Midori Kaikan, another ceremony for departing dolls, called ningyo kanshasai, was performed. Literally meaning “doll appreciation festival,” the basic idea underlying the event was similar to that of the temple in Ueno Park. 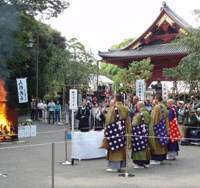 But the major difference was that the ceremony was according to Shinto practices rather than Buddhist ones. Yamada took along a dozen dolls, including both some traditional ones and soft-toy animals that belonged to her now 35-year-old daughter. At the same time, Yamada said, she was looking for the right opportunity to dispose of them because the dolls were taking up too much space in her apartment. “I’m very glad that they are well taken care of like this,” Yamada said as she surveyed the 5,000 dolls around the altar. Soon, a priest began to perform a ritual to drive out the dolls’ spirits and purify them. The ceremony was very solemn. Everyone was very quiet, as if it was a funeral — but this time there was no burning of the dolls. Both Okamoto and Yamada believed it just wasn’t right to simply toss their dolls into a rubbish bin, not least because of the memories that they embody. Each felt that doing so would in some way bring a curse down on them. In fact, many Japanese share their views — as the huge number of dolls brought to the two farewell events so clearly demonstrated. Where does such thinking come from? Generally speaking, observers agree that it is neither a Buddhist nor a Shinto teaching to thank and pray for the dolls. 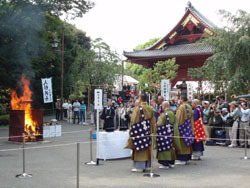 Religious institutions simply reacted to this uniquely Japanese outlook by creating ceremonies to meet a need. Historically, for instance, Kiyomizu Kannondo has long been a temple where couples would go and pray to be blessed with a child. When a child did come along, it was then customary for them to take a doll to the temple as the child’s substitute to prevent anything bad befalling it. As time went by, some people simply started bringing dolls they wanted to get rid of, and the temple began accepting them daily and eventually started the annual ritual 49 years ago. As a result, to meet people’s spiritual and practical needs regarding their dolls, similar events are held in temples and shrines across Japan, with owners normally paying “offerings” of around 3,000 yen per doll to for the service. In fact, one of the nation’s major “doll farewells” takes place today at Meiji Shrine in Tokyo’s Shibuya Ward. There, from 9 a.m., people will start bringing in their dolls, and a huge number are expected to surround the main shrine before the day is out. All very touching, for sure, but why do so many Japanese feel the need to pray for the dolls before abandoning them — to say such “Thanks and Goodbye,” as signs at Meiji Shrine proclaim? 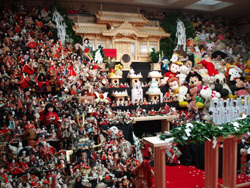 According to Sumie Kobayashi, who heads the reference room of doll manufacturer Yoshitoku Co., the key actually lies in the annual Hinamatsuri Doll Festival. The dolls for this occasion, traditionally representing the wedding of the Imperial couple, are displayed on a platform. They are admired and handled with care and respect. 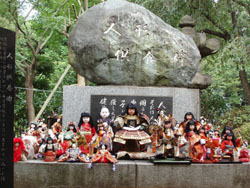 Kobayashi explained that festivals such as this are rooted in ancient purification rites performed as the seasons change, and that long ago the dolls were votive symbols in human form. In fact, she pointed out, the word for “doll” (ningyo) actually means “human form” when it is written in kanji characters. Kobayashi is a member of a group supporting today’s festival at Meiji Shrine, and she has helped to display the dolls there many times. 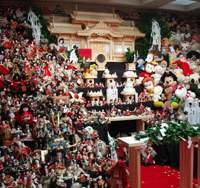 The number of dolls has been rising every year since the event started in 1989, she said, and this year is expected to top last year’s record of more than 38,000. After the ceremony is over and the dolls are purified, Kobayashi explained, most will be discarded as industrial waste. However, some with historical value will be kept to be displayed every year at the shrine after receiving the consent of the owners.